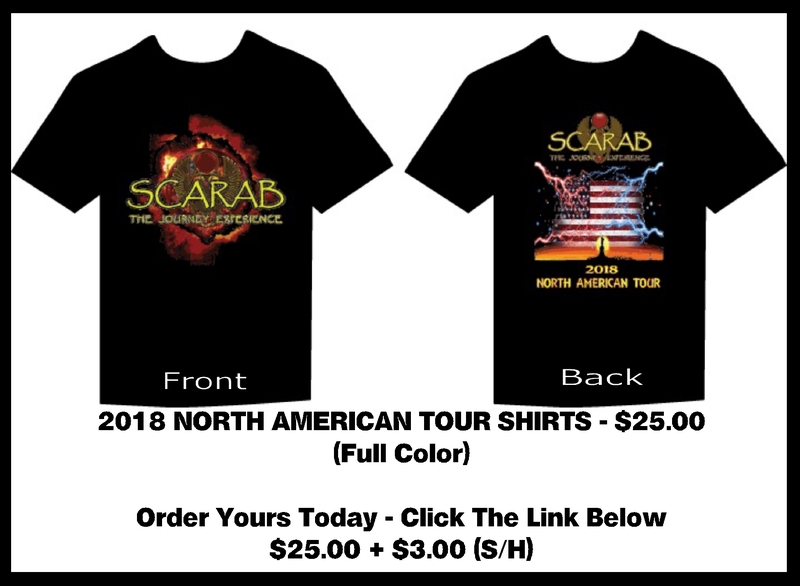 3/15/19 SCARAB's 2019 North American Tour has begun and many new dates are being added so keep checking back for areas near you! BOTTOMS UP will also hopefully be doing a couple one off shows this year. Stay tuned! 9/5/18 I will be performing at this event at around 6:30pm. 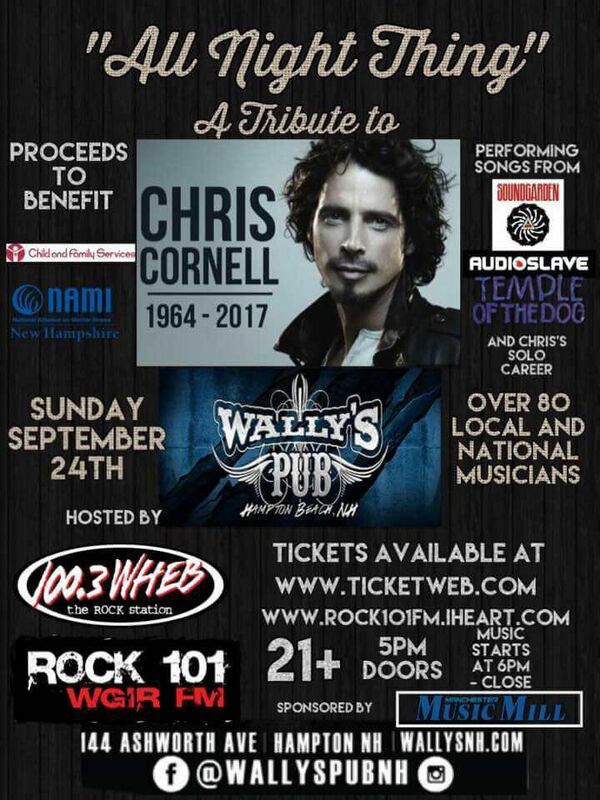 Come on out, say hi, see all the other great performances, enjoy amazing music and most of all support two suicide awareness charaties. For those of you who can't attend this show, here is the live feed broadcast, show starts at 6pm!!! in the new December 2017 issue of the U.K. FIREWORKS Magazine. Click on the thumb nail to read review. 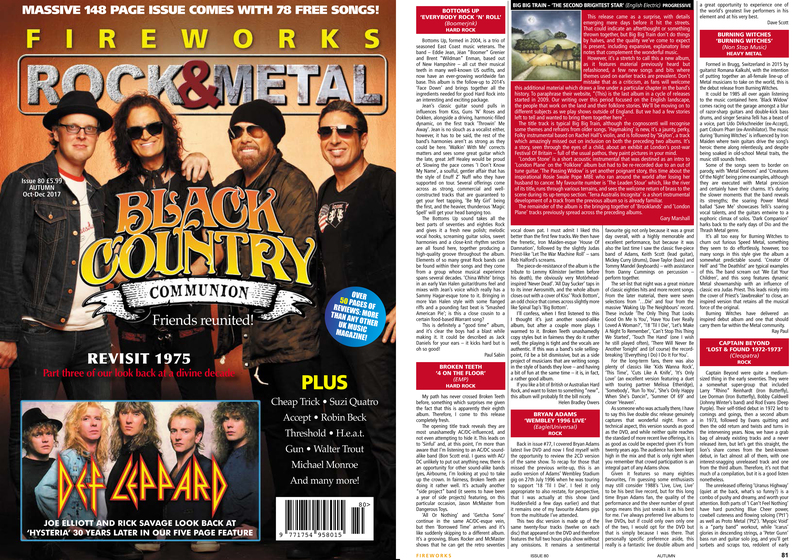 in the new September 2017 issue of the U.K. FIREWORKS Magazine. I will be taking part in this show and am honored to do so. Get your tickets now. It's close to selling out! 05/05/17 The 2017 SCARAB tour started back in Feb. and has been going strong . We have a few weeks off after starting dates in FL and just getting back from CO. We are hitting the road again in June starting in CT. and taking us down to the deep south again, all the way back through upstate NY to ME. We're just getting started and have dates through Nov. 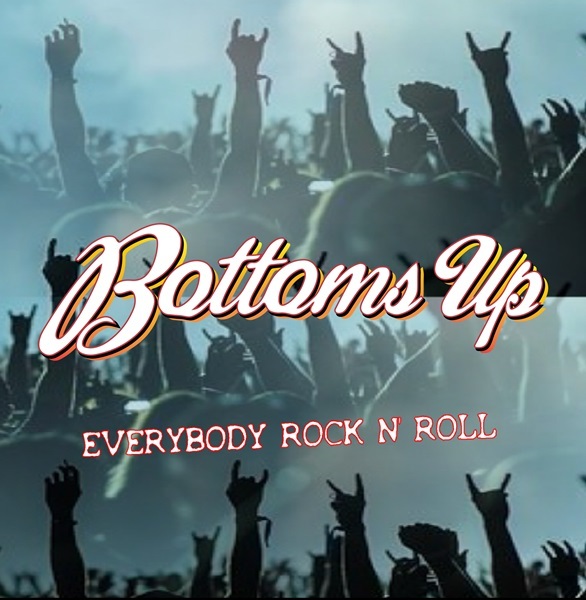 In BOTTOMS UP news, The new album : "Everybody Rock N' Roll" will be released on May 26th! We will be shooting some new videos for the first 3 singles. The physical (Jewel Case)CD version of the album is available right now for pre-order on the BOTTOMS UP website, as well as the download of the first single "Old Enough To Rock N' Roll" via iTunes & Amazon. Get it today and crank it up in anticpation for the full album! 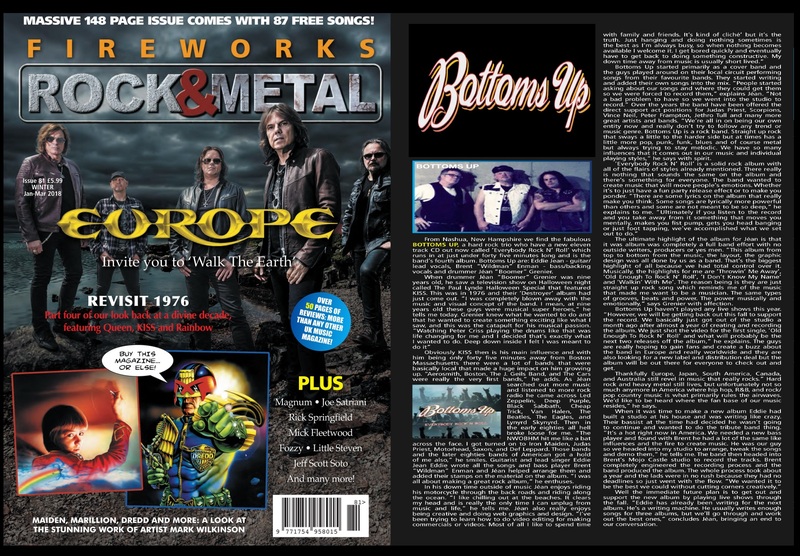 Go to : https://www.bottomsupband.net/merchandise and get all the BOTTOMS UP new music! All of the BOTTOMS UP previously released albums are also on the website so check it all out! 12/13/16 SCARAB finished up a successful second leg of the summer/fall tour and is taking a short break for the holidays. New 2017 tour dates are being added as I type and it's looking to be another great tour of the US next year. FL, MS, LA, MA & CO dates are already scheduled. Check the tour dates page for more info. BOTTOMS UP is tracking the final song for the new CD which will be released sometime in the spring of 2017. After the holidays we should be in the mixing stage, and planning the promo videos for the new album we'll be shooting. Lastly... I'd like to wish everyone a joyous and safe holiday season and a rockin' upcoming new year! As always, much love, health and happiness to you all, and I'll see you all back out on the road starting in Feb. Til then... Cheers! 06/25/16 The first leg of the SCARAB summer tour is now in the books and history. What a great bunch of shows from Maine to Texas. A couple highlights for me were playing to 30,000 people on 4th of July to celebrate America in Winslow ME, Atlanta GA, Melbourne FL (W/ Angels Of Babylon) & Jackson MS.
Have 8 days off then back at it for the second leg starting in Colorado that will take us back through the south and back up the east coast to the northeast. I want to thank everyone that has come out to the shows and packed the venues. You all make what I do worth while and fun and I'm honored to rock in your presence every nignt to entertain you. Enjoy the rest of your summer and I'll catch up with you back on the road next week. 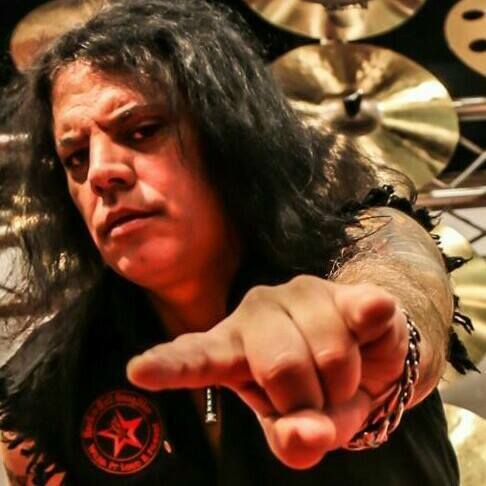 ALRIGHT KISS ARMY & ROCK FANS AROUND THE WORLD!!! The DELUXE CD PACKAGE is LIMITED TO THE FIRST 100 ORDERS. After That....THEY'RE GONE!!! PRE-ORDER YOURS TODAY!! Packages & CDs will start shipping on April 4th! WE THANK YOU FOR YOUR SUPPORT IN OUR FIGHT AND HOPE YOU'LL HELP US... HELP OTHERS IN NEED! First off, I'd like to say thank you to you all for another great year and for supporting me as well as the bands and projects I'm involved in. 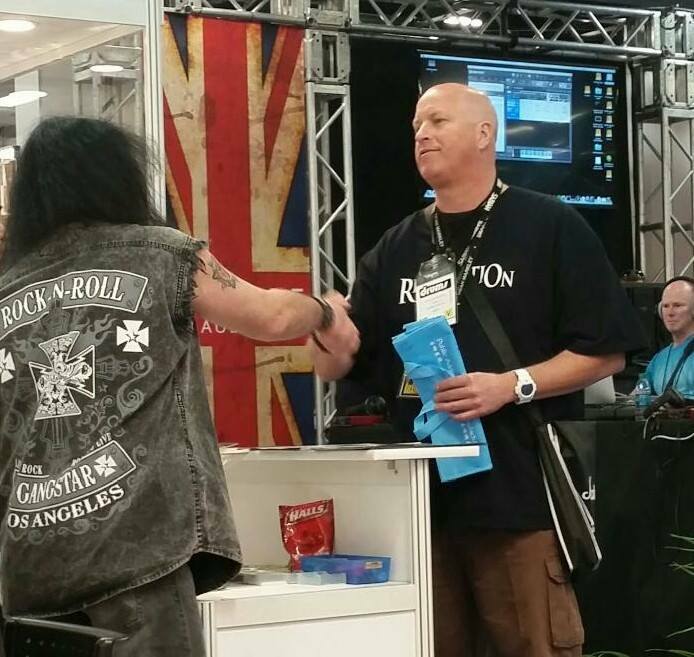 You all are what making music and touring worth while for me and I love rocking for you all. Here's whats going on right now for me. 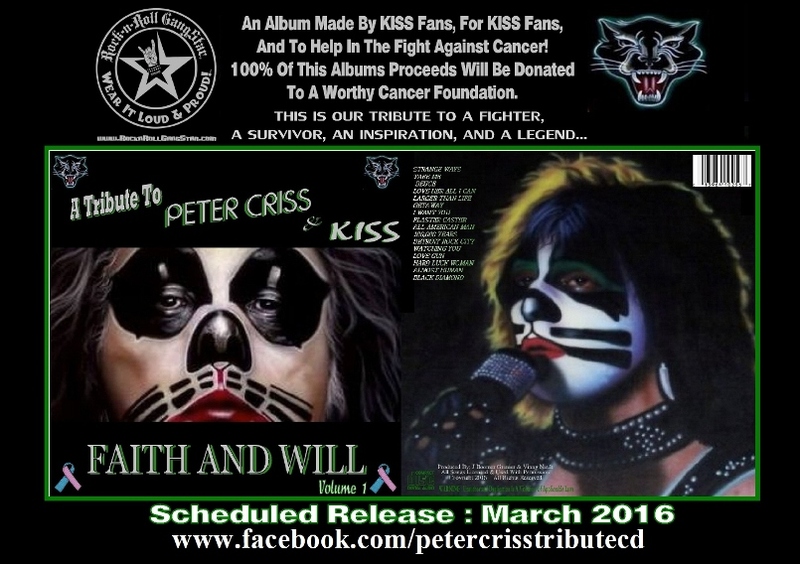 I am currently recording a Tribute to Peter Criss and KISS CD that is looking to be out in March 2016. All the proceeds will be going to a worthy cancer foundation to help fight against and find a cure for this ongoing horrible disease. 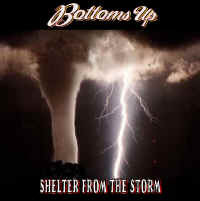 BOTTOMS UP is in the studio right now working on our follow up to "Shelter From The Storm". We're hoping to have it out by the summer 2016. I will also be touring around the country again with SCARAB in 2016. I also want to wish you all a great holiday season and an up coming prosperous, safe and healthy New Year for 2016. I'll see you all out on the road in 2016. Much love always and thank you for your ongoing support! 02/08/15 Here's the scoop so far for 2015. It's looking like I will be touring the US & Canada this year with SCARAB. Many shows have been added and many more to come. Keep checking back for updated tour dates. BOTTOMS UP have been hard at work writing new material for a new studio album. We have almost enough for a double album, but we'll demo and decide what will make it. Who knows... maybe if it's all worthy we'll record two seperate albums while we're in the studio. A huge thank you to all the companies, my A/R guys, and their great gear that I've been using recently or for years. You power me and my performances!! I am honored to be on your rosters. As always, I thank you all for the support... You all rock my world which allows me to rock yours! See you on the road! 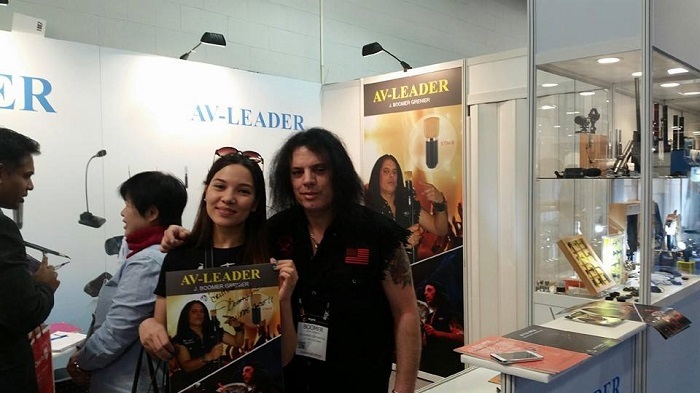 01/26/15 Thanks to everyone that came down to the AV LEADER booth at NAMM this weekend! 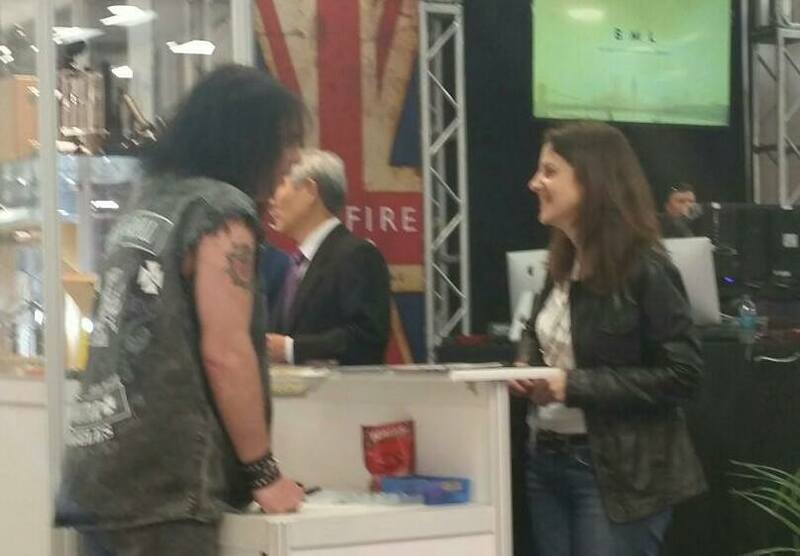 It was a pleasure to meet and chat with you all! Here's a couple of ya!! 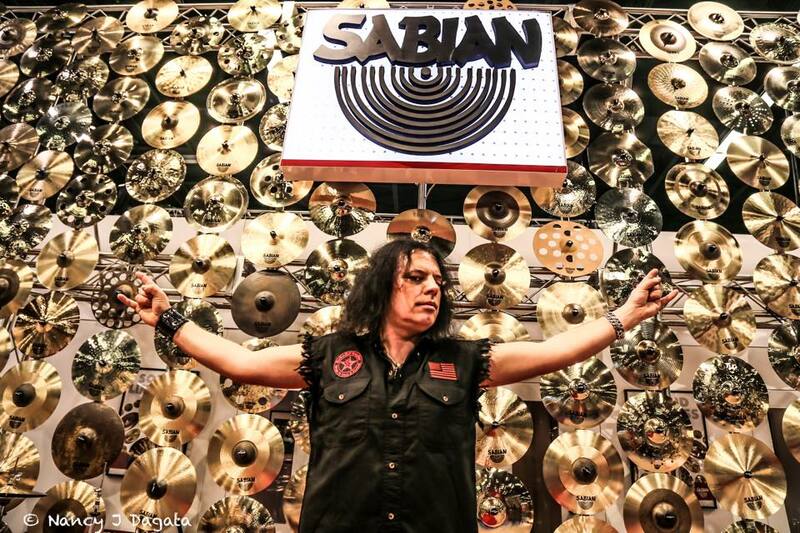 02/20/14 Boomer is very pleased to announce he has signed on as a new endorsing artist with Sabian Cymbals! 02/01/14 Just got the word that there are shows in the works for CA, AZ, MI, PA, VA, AL, FL and more. Looks like it's going to be a busy 2014 for SCARAB. Stay tuned and check back often as new dates will be added soon. 12/31/13 I hope everyone had a great holiday season and I want to wish you all a Very Happy, Safe, and Prosperous New Year! All the best to you all in 2014! 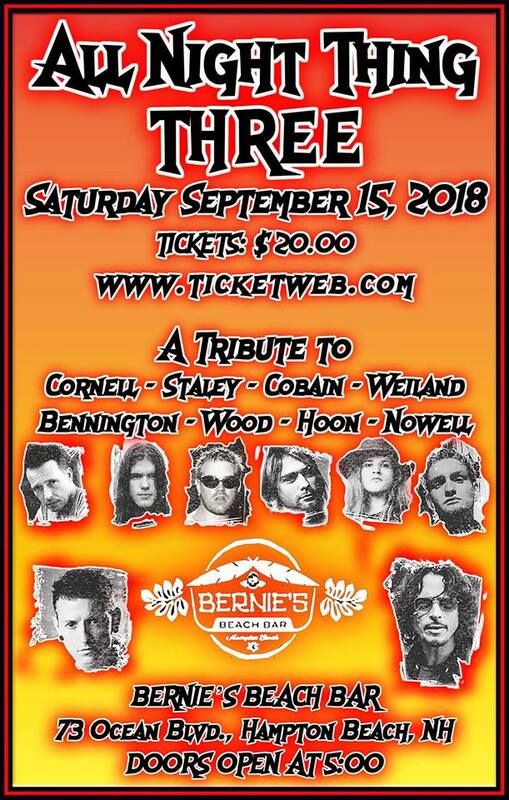 11/16/13 Due to unfortunate circumstances the remaining two BELIEVER 20th Anniversary/ Farewell shows in Stafford Springs CT. and Chicopee MA have been canceled. No makeup dates will be added. 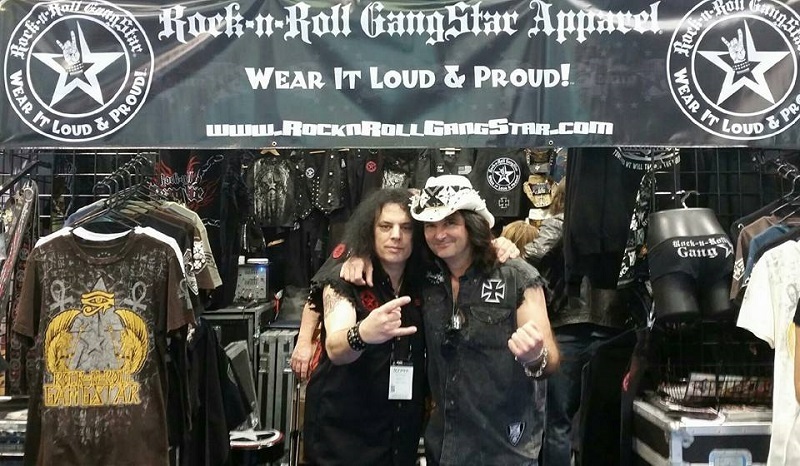 I wish my great friend/bandmate Micky a speedy recovery. 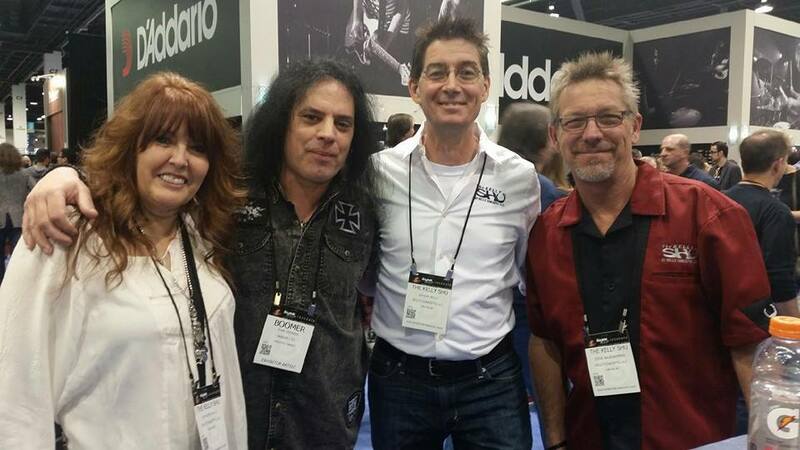 09/09/13 Lots of new news! I will be joining SCARAB (The Journey Experience) on a more regular basis starting on November 15th at The Hard Rock Cafe venue in Boston MA. BELIEVER will be wrapping up 2013 dates on November 1st. Check the Tour Schedule page for all the upcoming dates. There's so much going on and more things to announce soon. Keep checking back here, like my Facebook page, and download my free App for your android and iphone devices. See ya on the road this fall. 05/20/13 Boomer has been asked to be involved in a great new cause and help raise awareness of a constant issue ; Bullying. We've all known someone that may have been a bully to someone and the person on the receiving end. In some extreme cases children/teenagers have been put through so much abuse they've unfortunately found no other alternative to stop the constant pain or bullying and take their own life. This action has GOT TO STOP. 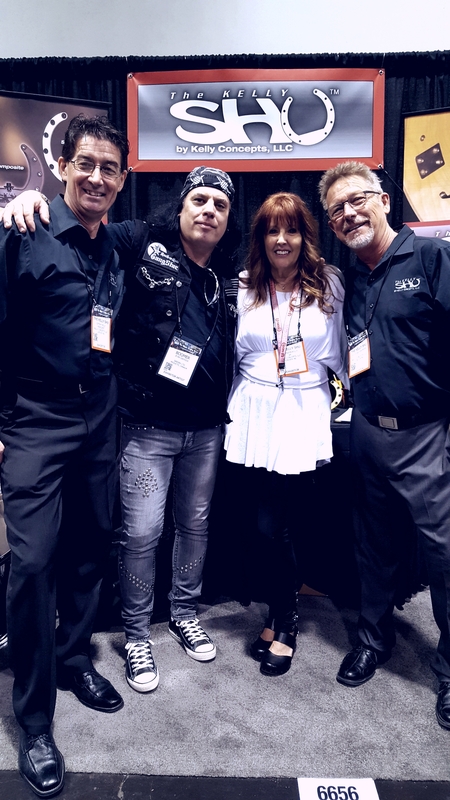 Rockers Against Bullying is an organization that is raising awareness about this on going problem and helping people that have been bullied, families that have lost a loved one due to bullying, and also getting people the help they need to overcome through music related events. Please check out this facebook page, like it, and share it. You could help make a difference in some ones life. Thanks in advance! 04/06/13 Lots of NEW dates have been added to the tour page. 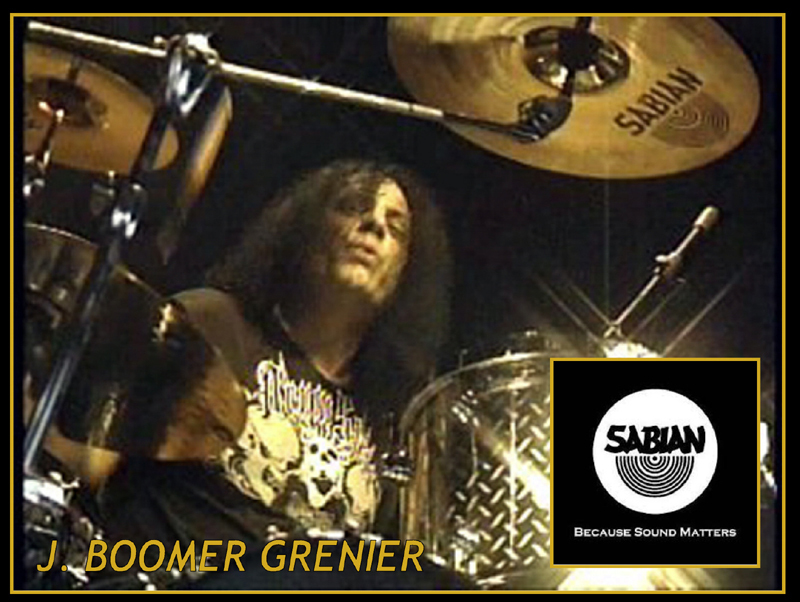 Boomer will be doing various dates through the summer with SCARAB (The Journey Experience) in between the BELIEVER (20th Anniversary/Farewell Tour) that will go through November and BOTTOMS UP shows through the summer and fall.
" I hope to see you all at the shows. 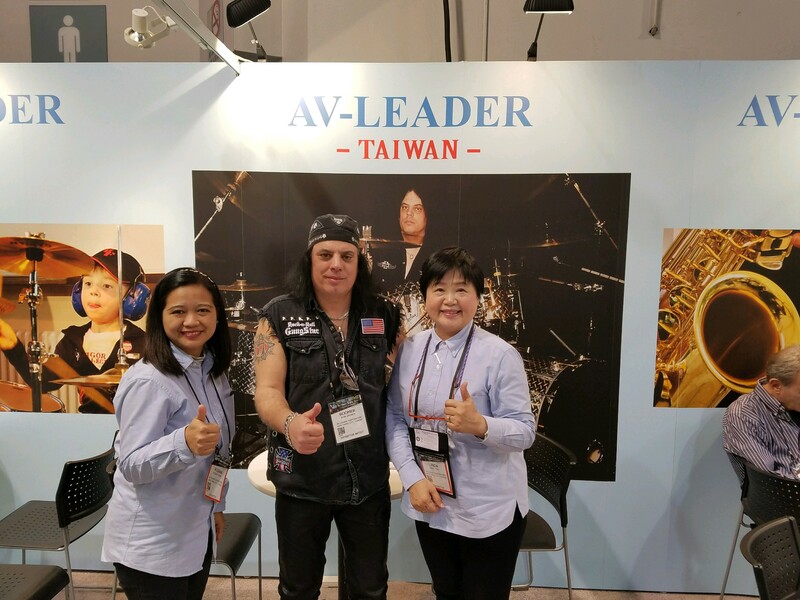 Thanks for your continued support !" 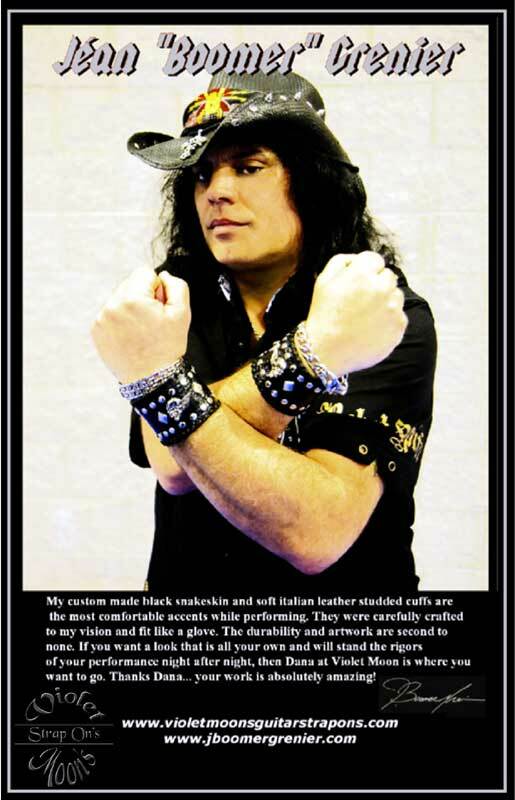 02/16/13 Dana, from Violet Moon Guitar Straps and leather creations has a new endorsee. That's right.. Click on the picture to go to her website and check out her great work and accessories. They can be custom made just for you! 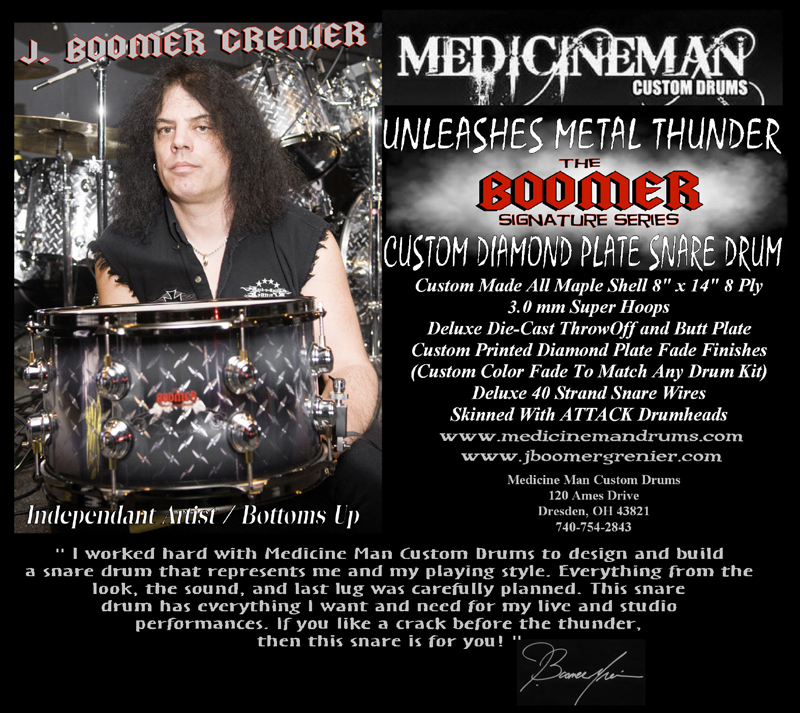 02/07/13 Boomer will be endorsed and working with CTM (Clear Tune Monitors) this year. 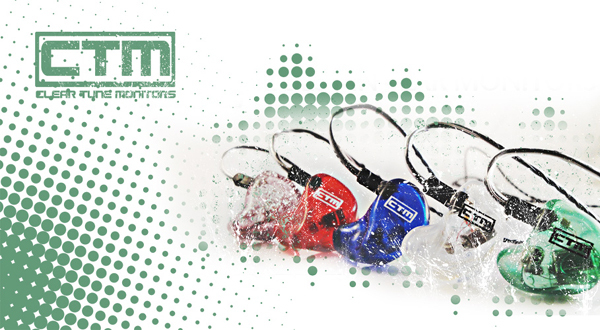 He will be using new in-ear monitors that were specifically customized for him for all his 2013 shows! . 12/16/12 I'd like to wish everyone a very Merry, Safe And Happy Holiday Season! I'm gearing up for what is sure to be an extremely busy 2013. 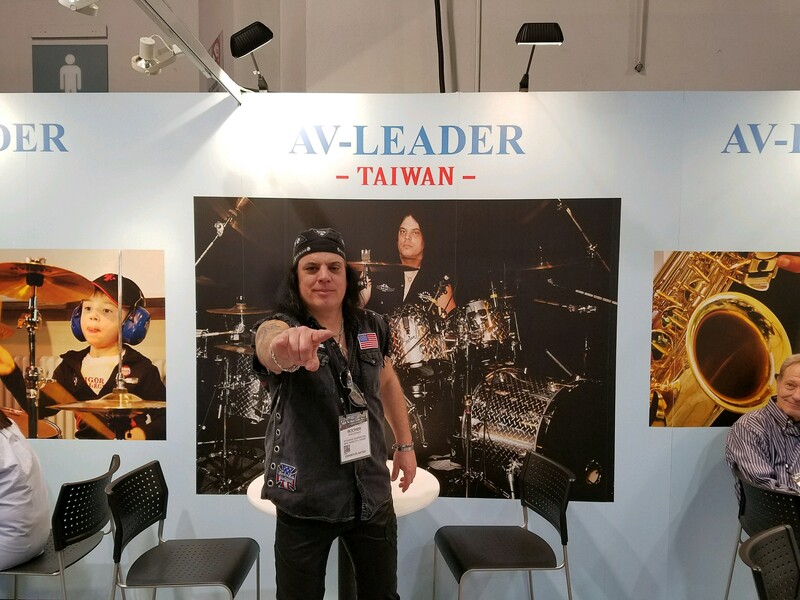 I will be on the road with BELIEVER for their 20th Anniversary tour and also with SCARAB (The National Touring Journey Experience Show) doing various dates. These tours will take me throughout the US and Canada. The dates and tours are being put together as I type. I will add all the info as soon as I get it. BOTTOMS UP will be doing various shows also through 2013 in support of the long awaited new studio release. Keep up and chat with me on Facebook, and down load my FREE new APP for your iPhone and Android phones and devices. Search : Jean Boomer Grenier in your APP store. I'm looking forward to seeing you all in 2013 and as always, Thank you for your continued support in all I do! YOU ALL ROCK!! 10/31/12 Happy Halloween everyone! My favorite holiday! BOTTOMS UP is back and doing a Sneek Peek show on Thanksgiving Eve in Tyngsboro MA. We welcome Bruce Bennett to the band taking over the bass duties. Bruce is best known for his work in the in The Gary Hoey Band. Good things are on the way! BELIEVER is planning on embarking on a 20th anniversary tour in March of 2013. I also have some other things planned for 2013, but til then... back to Halloween horror! Enjoy my friends! 10/04/12 BELIEVER date for 10/13/12 @ The Rock Junction in Coventry R.I. has been POSTPONED! In BOTTOMS UP News.... 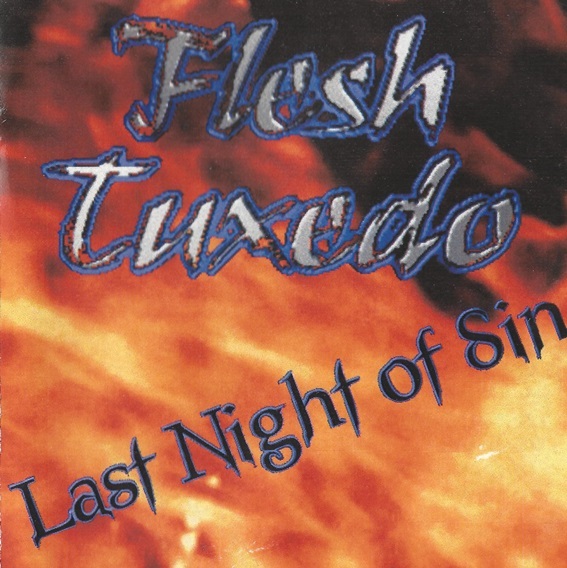 The band is back together and working on finishing the final mix of the long awaited new "Yet to be titled" CD, as well as rehearsing for some 2013 dates. Stay tuned and keep checking back! 8/16/12 NEW BELIEVER dates added for August & September! 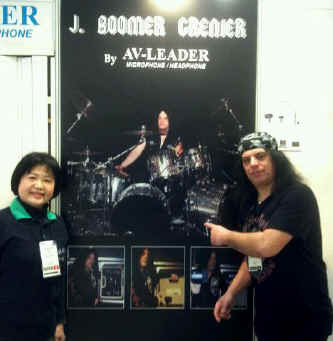 The Boomer APPS are receiving downloads worldwide and have been getting great reviews and usage! Get them now for FREE for your iPhone & Android phones or tablets. 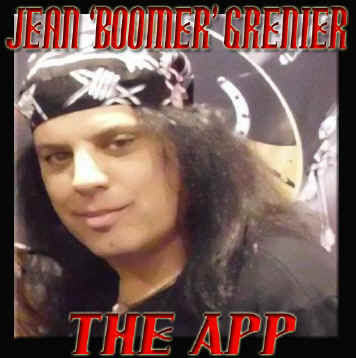 Search Jean Boomer Grenier in your app market! 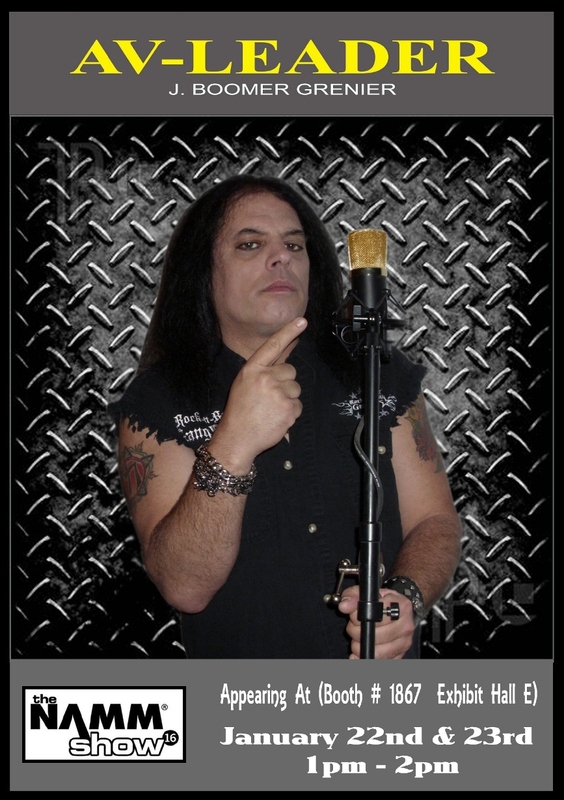 Also come aboard and "like" my Facebook music page from the banner link! See ya on the road and be well! BOTTOMS UP will be taking some time off from the road in 2012, but will continue the mixing process on the latest CD. "It's been a long process but we're hoping everyone will find it to be as amazing as we think it is and worth the wait." New BELIEVER dates have been added and there will be more coming soon. Keep checking back! 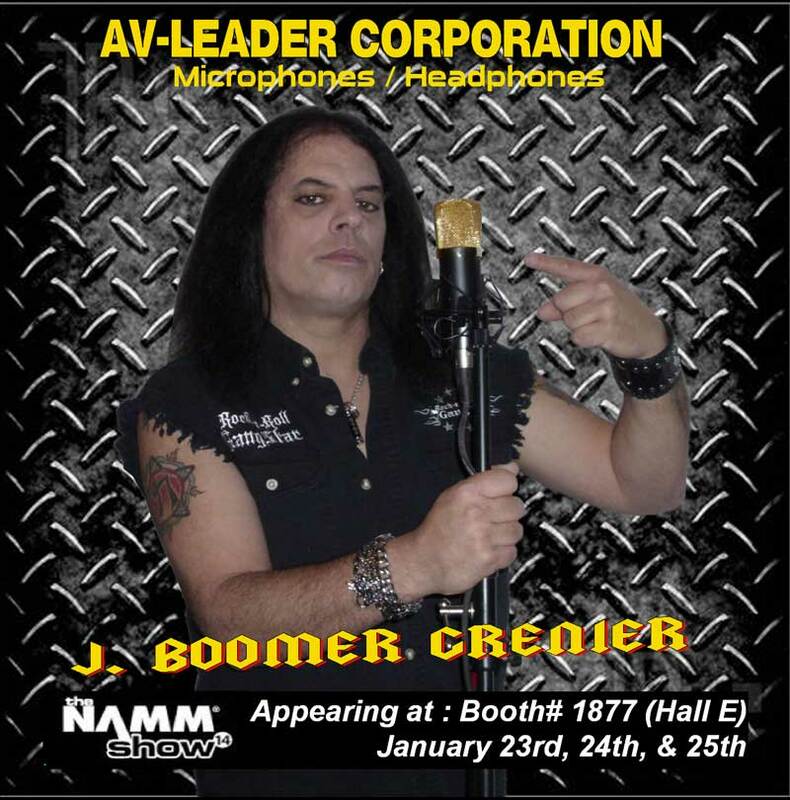 An iPhone & Android FREE App are now available for easy access to follow Boomer on the road, on youtube, on facebook, along with other info, music and downloads features. 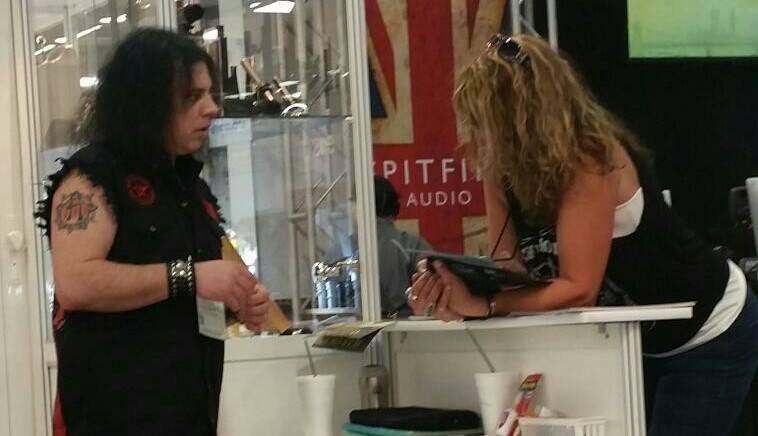 Keep up on all the bands and projects Boomer is involved in right on your phone. Here is the link for the Android phone App below. Hey there my friends. I hope everyone is well and rockin'! 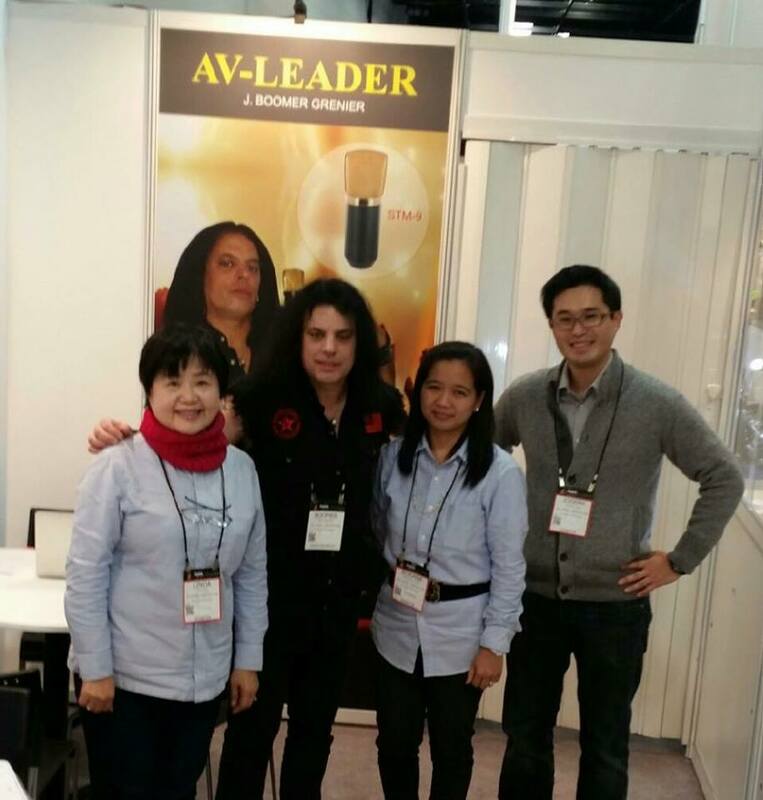 and staff have been very gracious to me since I signed on with them in 2010. I use their mic's on my drums live, and in the studio to get my thunderous "War Machine" sound. Wanted to wish you all a very Merry Christmas and a very Rockin' New Year! Wishing you all peace, joy, happiness & great health! See ya next year to rock together in 2012! Due to prior commitments, J. Boomer Grenier has left the drummer position in THE HOUNDS OF HASSELVANDER. While all is well in THE HOUNDS camp, and the new CD "The Ninth Hour" scheduled for release on 11/26, a tour must follow and Boomer is unable to participate. The split is amicable and most likely temporary with studio and possibly more live performances almost certain in the future. Brothers bonded in spirit, mind, and music.... Joe Hasselvander and J. Boomer Grenier support each others musical ventures and will continue to do so hoping to work together again when the moon is full and the hounds bay in warning of the impending doom. Boomer welcomes T.C. Tolliver (formerly of The Plasmatics) to THE HOUNDS. " I wish Joe, T.C. and the band nothing but the best and have the utmost respect for them. I'll always be a part of THE HOUNDS OF HASSELVANDER family and look forward to whatever comes down the road". holiday and a fun time of the year for most. I'd love to see your cool rockin' & scary Halloween costumes. signature sound. There's plenty of catchy riffs and choruses with melodic harmonies thrown in also. I/We can't wait for you to hear it and hope you will all dig it as much as we do. 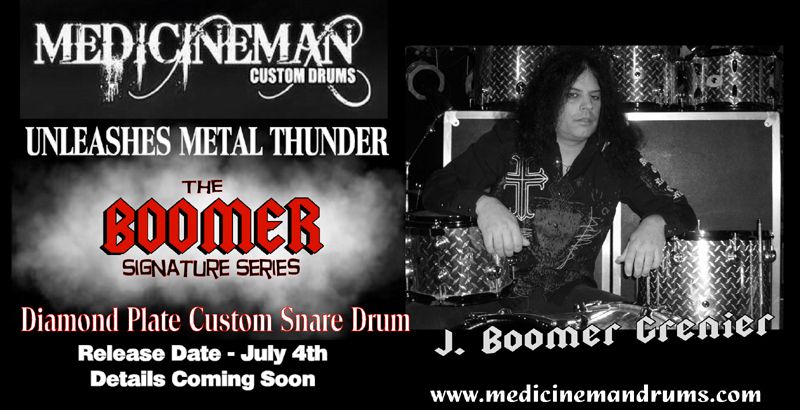 I have a few things on the drawing board for next year that I've been working on, as well as some new signature "Boomer" drum gear that I'll hopefully be able to tell you all about soon also. It's cool exciting stuff that I look forward to sharing as soon as I can. and "Like" my new page. I'd be honored to have you on board with me there as well. You can keep up with where I'll be and what I'm doing musically on a daily basis. Please also feel free to share it with all of your friends and anyone you think would be into what I do musically. of what I do. Keep on sending me emails. I love hearing from you all and chatting music and answering questions etc. ! I live and breath music and am just as much of a fan as I am a musician. Music is universal and really what makes the world, and "my" world go 'round. See ya on the road and the web! 8/18/11 I'm blown away by the overwhelming positive responses from around the world on my new website. Those in Russia, Italy, Indonesia, Serbia, and Brazil ... Thank you and I'm honored to have you aboard. I sincerely appreciate you all and your constant support! BOTTOMS UP will be continuing on in the studio finishing up a few vocal tracks. We should be on to mixing and mastering the new CD in September. We're shooting for a release date in time for the holidays. I'll keep you updated on the progress. Hey there everyone! My new website is almost completed and hopefully it will help you all, (and myself too) keep updated on everything I have going on, with who and where I'll be playing, & all new news and happenings with me and any projects I have going on now or in the future. If you have any cool pictures from any of my shows or appearances you'd like to see in the Galleries section, please feel free to email them to me. I'd love to see them & share them as well. If you have any questions, comments, or just want chat music, please feel free to hit me up anytime. I'd also like to thank my webmaster (Mike H) for all his hard work & time on this website. Thank you all for your continued support, and for supporting the bands and projects I'm involved in. 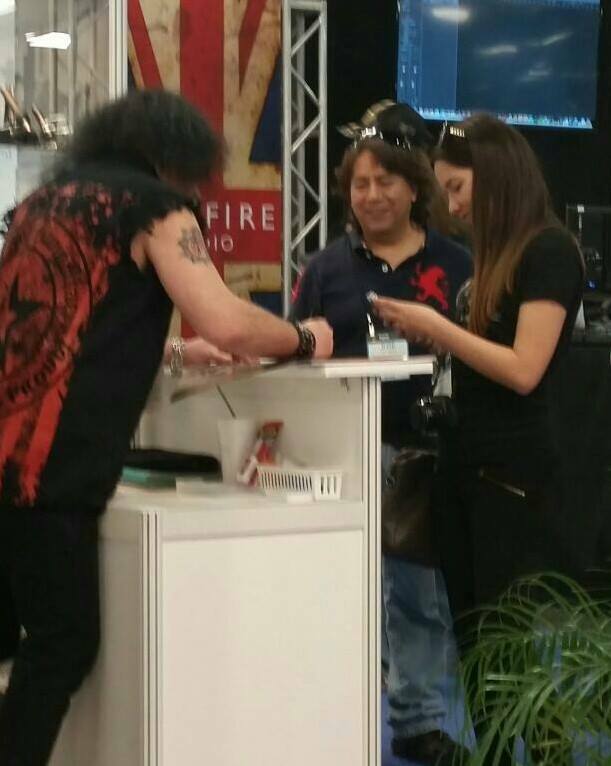 I sincerely appreciate it and look foward to see you at the shows. Have a lot of things going on and keeping busy, busy, busy! Will have some new exciting announcements coming this month. BOTTOMS UP is in the studio in between shows recording a new CD. KISS'D OFF will be out for a couple shows this month. last year, and while things got off to a slow start with line-up changes, dates are being added and they start April 30th in Rhode Island. 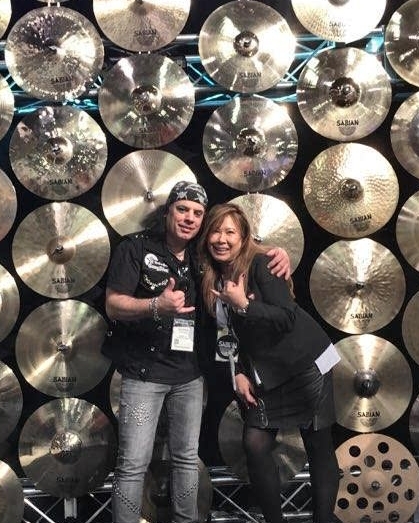 Sadly due to the recent tragedy in Japan, It's looking like the clinics/dates I was to do later this month with Steve Burrows will be postponed and rescheduled. My heart still goes out to Japan, my friends and their families there. You are in my daily thoughts and prayers. 3/13/11 The merchandise page is now up and running! Also the links to the digital downloads are up. 2/7/11 Welcome to J Boomer Grenier.com where you will find all you'll want and/or need to know about what's going on with Boomer. Parts of the site are still currently under construction but please keeping checking back for news, info, dates, appearances and more. There are many things in the works to be announced soon.